When my husband and I moved to our Northern Illinois farm in 1978, we inherited a flock of Guinea fowl. These comical birds gave us endless hours of entertainment. The feathers of the Guinea fowl are highly patterned, with black, white and gray dots. 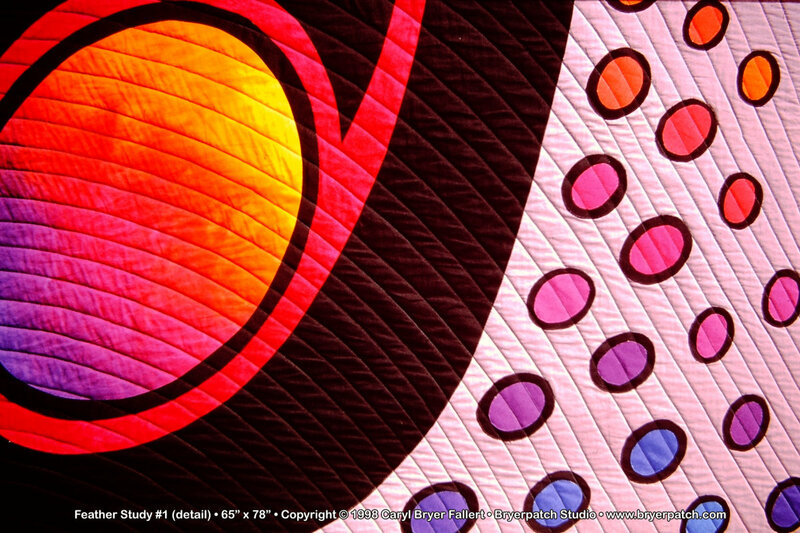 The design for this quilt was inspired by a macro photograph of one of the feathers of a Guinea fowl. 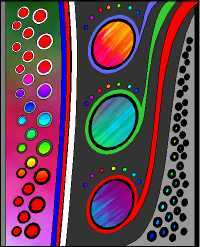 Of course, I took many aritstc liberties with the colors of the feather, turning it into a graphic design, that departs substantially from the original photographic inspiration. Line drawing done in Corel Draw! The design process began with a photograph of a Guinea fowl feather. 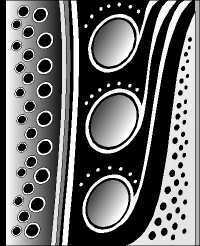 I drew this very graphic interpretation of the feather directly on the computer using Corel Draw!, my computer drawing program. I experimented with various arrangements of value, in a black, white and gray study. After that I experimented with many different arrangements of color, even filling some of the shapes in my design with direct scans of some of my hand painted fabric. When I felt I was ready to begin the quilt, I printed out the color study I liked the best, to use as a general guide. The line drawing was enlarged, using an overhead projector. The large paper drawing was cut up into individual pieces, which were used as templates for cutting the fabric. The quilt is pieced and appliqued using hand painted and gradation dyed fabrics. On the left side, the background is a fabric painted with a gradation of purple, blue and green. 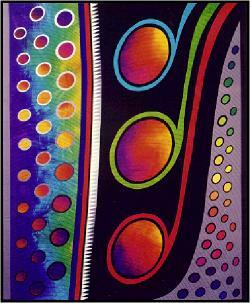 The eliptical dots are graduated from purple to red, to orange, and gold. These dots are surrounded by rings that graduate from black to gray to white. In the center the background is black, with three large elipses in the colors of fire. The background on the right side of the quilt is medium gray, with smaller, eliptical dots, surrounded by rings of black. 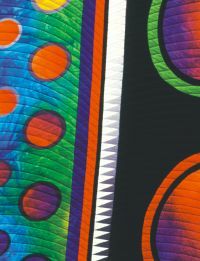 Separating the colored background fabric and the black background fabric, are several, vertical, solid colored stripes, and a single sawtooth stripe that graduated from black and white at the top and bottom to gray and white in the center of the quilt. 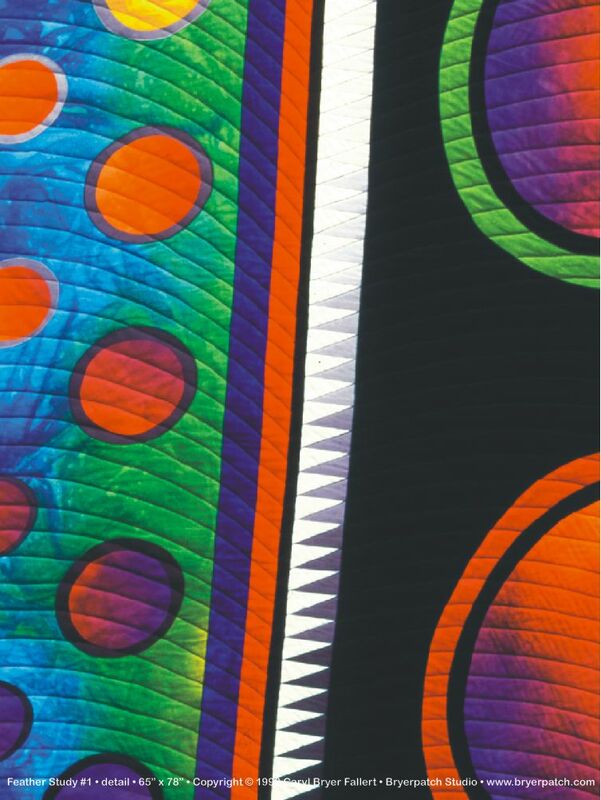 The quilting pattern is a series of curving lines at one inch intervals, representing the individual vanes of the feather. These lines emerge from the vertical center stripes, which represent the center shaft of the feather. The quilt is completed with a 2" black border on the right side, and a 2" gray border on the left. A black binding surrounds the quilt. 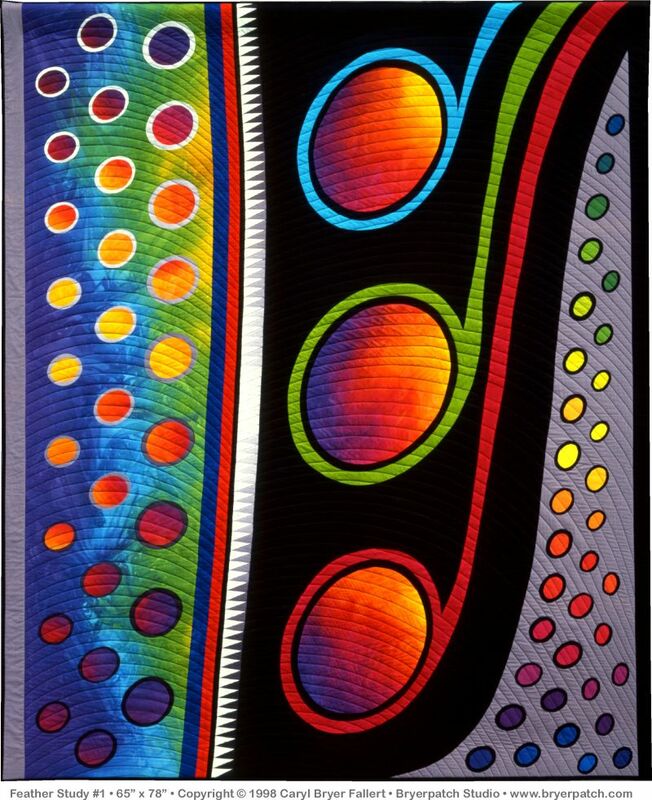 The back of the quilt is made from a comercially printed fabric with colorful eliptical dots on a black background, similar to the appliqued dots on the front of the quilt. Quilt National '99, The Dairy Barn Cultural Arts Center, Athens, OH and traveling for three years.